French design is known for its charm, lucky for our children we can buy some of that charm from Airdeje Boutique. This French design studio produces nursery decor, baby accessories and sleeping textiles that ooze grace. Airdeje fabrics co-ordinate with each other, making nursery decoration a cinch. Or if you like to mix and match, these patterns can play wonderfully next to soft stripes and plain colours. With decorative edging, even their change mats can bring decorating triumph. If it’s sleeping triumph you seek, check out these cute cotton sleeping bags (£56 above) with polyester filling. They should satisfy cold winter nights and your baby can stay snug during every kick and turn. 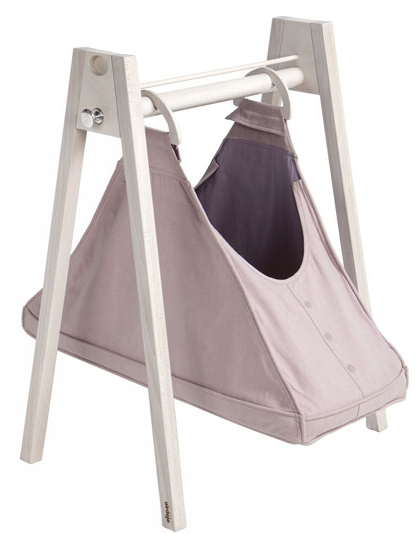 If bubs is too little to roll about they might love this new baby hammock (€239 below) as much as I do. It’s portable and light-weight enough to carry in a canvas bag. There are three colours of frame and basket to choose from. The basket comes in Pink with Purple interior, Taupe with Blue Grey interior and Grey with blue interior shading. The frame design is simple and comes in Natural, Black and Bleached. Airdeje designs are inspired by folklore, retro and bohemian style. If their room shots are anything to go by, mixing these inspirations result in blissful decorating. Browse Airdeje Boutique online. To view it in English, translate it using Google translator first. Or buy a selection online from UK based store Petit Home.